Chromogenix Coamatic® Protein C is a chromogenic assay kit for the quantitative determination of protein C activity in human citrated plasma. Protein C plays an important role in the anticoagulant regulatory mechanisms. Hereditary and/or acquired Protein C deficiency has been shown to be a risk factor for development of venous thrombosis. No influence of heparin levels up to 3 IU/ml. Simple and rapid performance gives optimal user convenience. Excellent accuracy and precision as well as reagent stability. Validated and documented protocols for a wide range of instruments. Suitable for both large and small laboratories. S-2366™ 6 mg, 2 vials. Lyophilized chromogenic substrate pyroGlu-Pro-Arg-pNA·HCl. Stability after reconstitution: 3 months at 2-8°C in the original vial. 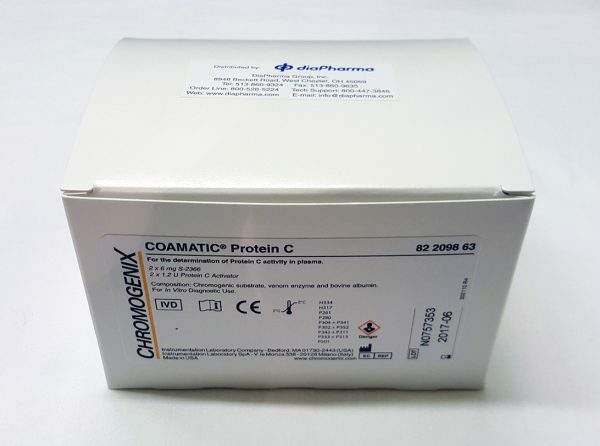 Protein C activator 1.2 U, 2 vials. Lyophilized venom enzyme from Southern Copperhead Snake (Agkistrodon Contortrix Contortrix), with bovine serum albumin (stabilizer) and Ciprofloxacin® (preservative). Stability after reconstitution: 3 months at 2-8°C in the original vial. The sealed reagents are stable at 2-8°C until the expiry date printed on the label. WARNING: Do not use reagents beyond the expiry date printed on the package label. Discard if the substrate solution appears yellow. Protein C in plasma is activated by a specific enzyme from Southern Copperhead Snake venom. The amount of activated protein C is determined by the rate of hydrolysis of the chromogenic substrate S-2366™. The pNA release measured at 405 nm is proportional to the Protein C level in the range from 0-120% of normal plasma.